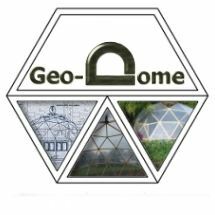 It’s well known that dome structures are easier than conventional buildings to keep warm because of the 30% or so less surface area they have, but what does that mean in the real world? To find out I did some temperature analysis over a few weeks and compared the temperature inside my dome to the temperature outside. 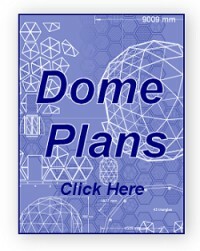 The dome had just been finished, in fact not all of the insulation has been installed but I would be using the dome soon and the only way to get accurate data would be not to use the dome wile I do the tests, cooking, working, running computers all generate heat so to get a base line figure I would need to stay out of the dome while the tests were carried out. To get an idea of how the dome temperature was affected by weather I took data across a week that started quit sunny turn dull and wet then finished with a fine day. Dome temperature is in Blue, outside temperature in Red. Largest temperature difference was midnight march 7th – the dome was14 degrees warmer than outside. Outside temperature exceeded dome temperature midday March 14th by 5 degrees. Outside temperature varied by 20 degrees, Dome temperature varied 7.5 degrees. I was amazed at how efficiently the dome kept its temperature, on clear days the solar gain could raise the inside temperature by 5 degrees or more, this was great in bright frosty weather but if the weather was cold and dull the temperature would slowly drop in the dome. When the weather warmed the dome would stay cold because it was well insulated, causing the ironic effect of being warmer outside. 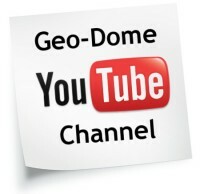 Further tests showed that the dome was something special when it comes to heat efficiency. I could raise the inside temperature by 2 degrees by training on an exercise bike for 40 minutes. I could raise the temperature by 12 degrees by putting the cooker on slow cook for a few hours (with the door shut). I used a 400 watt halogen heater to heat the dome over the winter of 2005 – 2006 this easily kept the temperature comfortable and was only needed when there was not enough solar gain because the weather was overcast. I have just checked my temp gauge tonight and it reads 22.8 degrees inside the dome and 3.5 degrees outside, that’s a difference of 19.3 degrees, the only heating in the dome is me, my two dogs and the heat from this computer! Temperature testing my geodesic dome What size dome and struts is this and what was the insulation used? Sorry to be picky, but are we using Fahrenheit or Celsius here?